I took a weekend recently to really try and tidy my desk and workspace in our room. It was a bit of a mammoth task as neither Robert or myself are particularly tidy individuals and the desk is one of the first places to get messy. It took pretty much the whole weekend to get it looking remotely usable and it's not exactly one you'd find on Pinterest, but I can finally use it! It's going to take a bit of time to get it looking exactly how I want it and to organise all of my files and folders (and all the Harry Potter and Star Wars knick knacks) but it will do for now. It's also pretty likely that it will remain like this for a good few months as I doubt I will find the time to continue working on it. It will be good to actually be able to use it for planning events and sessions for my new job and writing blog posts rather than sitting on the sofa distracted by the tv. The light in our room is better than most as our house can be a little dark at times so it's nice to use the desk for taking some more decent photographs with better lighting. 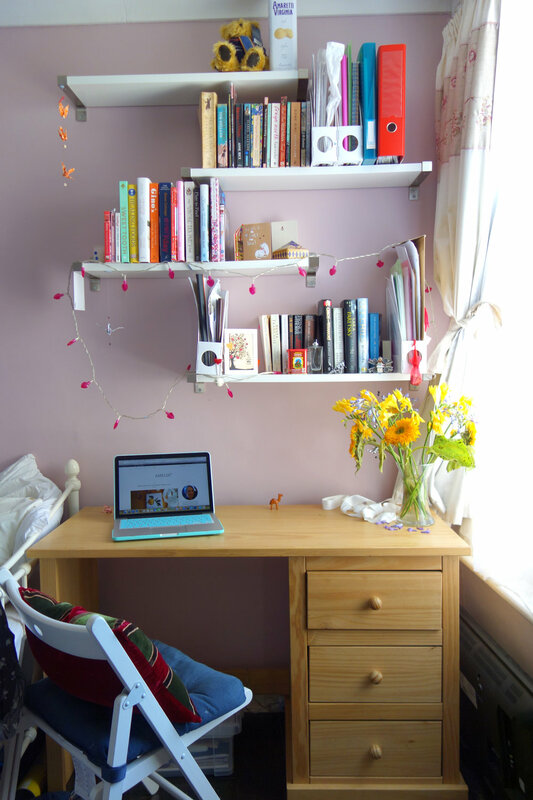 It's easy to scroll through Pinterest and lust over some of the beautiful work spaces, and it would be amazing if my desk looked even a little like some of them, but even if it did it would still get super messy. I think it's important to remember that most of those images on Pinterest are from a moment frozen in time (just as my pictures are), and likely very curated to make it look exactly just so. They are images of an aspirational life that at any other moment is probably just as untidy as mine normally is.